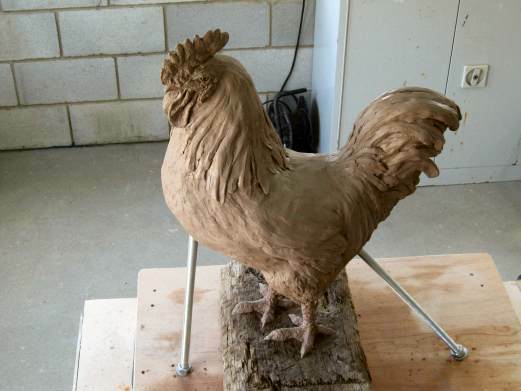 As with all my sculptures, a piece to be cast into bronze resin is first made in clay, over a metal armature. Once the clay is ready, a mould is made of silicone rubber. This is likely to be in at least two parts, with the seam(s) along the highest points of the shape. The silicone then has to have an outer rigid ‘jacket’ of fibre-glass (or plaster), which will have seams in exactly the same places. Once this stage is completed the mould is opened, and the clay removed. The first stage of a bronze resin casting is to coat the inside of the opened mould with a mixture of resin loaded with bronze ground to a fine powder. 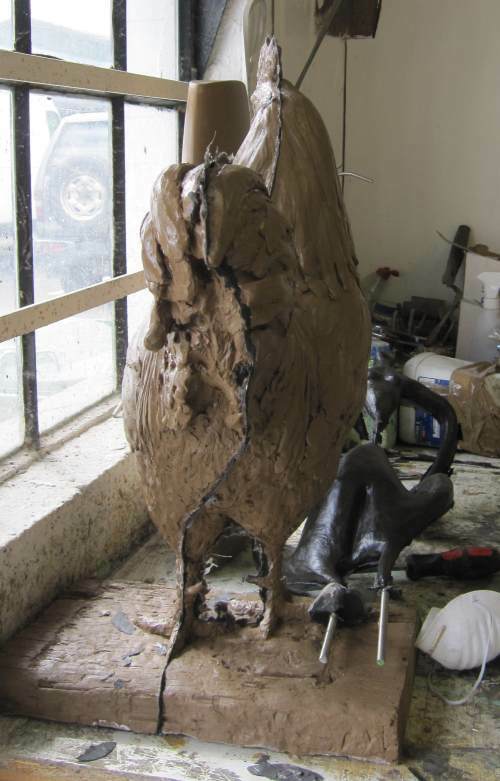 The bronze will be added at the rate of 100% by weight with the resin. Once the outer layer is complete, a decision will have been made either to close the mould and fill it solid with resin (for smaller pieces) or to back up the first coat by laminating it with resin and fibre-glass. In both cases thin parts like legs may also need metal reinforcing rods to give added strength. 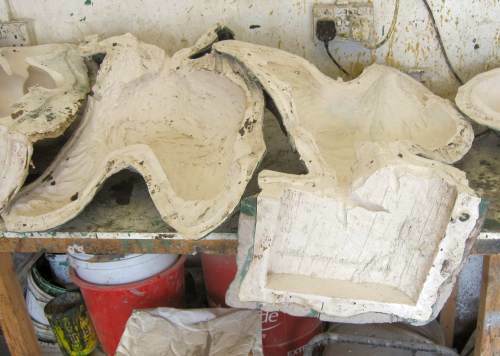 When the resin is fully set, the mould is opened and the piece taken out. There will be marks where the seams of the mould were, and the surface will look disappointingly unlike bronze at this stage. The seams have to be cleaned up and if necessary filled with a bronze resin mixture, and worked with tools so that they are no longer visible. The entire piece is then worked over with very fine wire wool. This process abrades away resin which is softer than the metal, so that the outer layer of the sculpture is then comprised of bronze held in a matrix of resin. 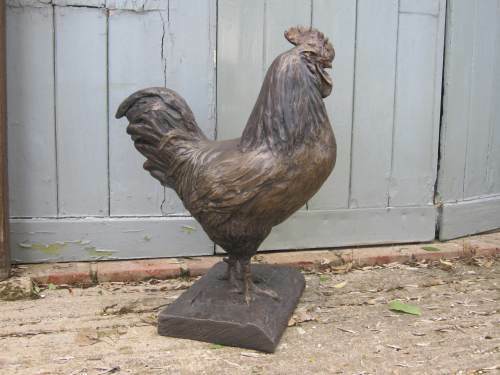 The final stage is to patinate the bronze to give the desired effect, and finally to apply a coat of wax to protect the patina. The process is the same for stone resin or iron resin, but with ground stone of the desired kind, or fine iron filings filling the outer layer instead of bronze. 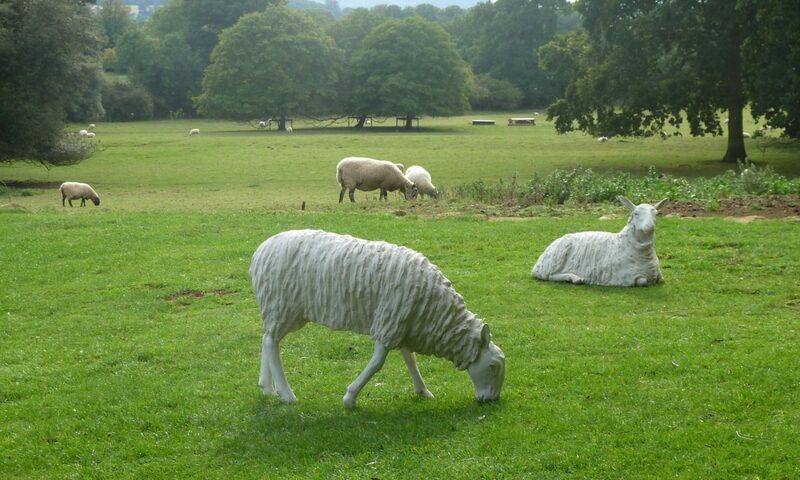 Caroline's work is about capturing essential character and inner life as well as the outer form, and the sculptures are based on intensive observation and knowledge of the subject. She is fascinated by the way thought and instinct are expressed externally in form. Particular inspiration comes when a subject is totally absorbed - whether in stillness or activity – and unselfconsciously reveals something of itself.